There is no Eunice Pomfret. There was, however, a Eunice Vail Wood of Pomfret, Vt. 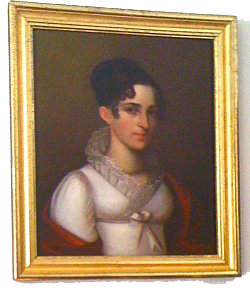 Her portrait, painted in about 1830, hangs in the office of our founder, Patricia J. Washburn, Eunice’s six-times-great-granddaughter. Eunice’s lasting beauty and classic style exemplify the qualities we hope to bring to each project we do. Eunice (Vail) Wood was the granddaughter of a Revolutionary War veteran and grew up in Pomfret, Vt. She married a Congregational minister, Amos Wood, and raised seven children. When she was growing up, Pomfret was still a bit rough around the edges, having been carved out of the wilderness a mere 50 years before she was born. This portrait, painted when she was about 27, shows her as a young mother. Portraits like these were not just commemorations of a person’s likeness, but also of the family’s aspirations to gentility and middle-class good taste. Alas, the painter most likely painted the body first and then added Eunice’s head when he got the commission, so she probably never wore that gown, cloak or necklace in real life. The painting is unsigned, but is believed to be by an itinerant portraitist named Benjamin Franklin Mason (1804-1871), who plied his trade around the Pomfret area. His works hang in several Vermont museums, and one of his paintings was included in an exhibit of “American Provincial Paintings” at the Whitney Museum in New York in 1942. Eunice’s portrait is listed in the Smithsonian Inventory of American Paintings. In 2009 it was moved from Massachusetts, where it had hung for more than 40 years, to Portland, Maine, and was restored by B.D. Matozzi, with frame restoration by Michele Caron.